It's a car you can't really drive, but RM Auctions expects that a 1939 Pontiac with a Plexiglas body will go for anywhere between $275,000 to $475,000 at the St. John's auction that's being held as part of the Concours d'Elegance of America in Plymouth, MI this July. The Pontiac was built for the 1939-1940 New York World's Fair and appeared as part of General Motors' "Futurama" exhibit that showcased how the immediate pre-World War II imagination pictured 1960. See-through cars were not part of the prediction, but a tough new transparent material that could be molded into such a complex shape was certainly something worth showing off. The Pontiac's body was created by Rohm & Haas, inventor of Plexiglas, to show off its revolutionary new material, and this particular car is the only one of two such vehicles that's known to survive. This Poncho is unrestored, so there's some visible damage that's been accumulated over the years, but this impressive artifact is the first full-size automobile rendered see-through and therefore deserves a place of prominence in someone's collection... or living room. Either way, it will be a conversation piece. Who knew Wonder Woman drove a Poncho? For its upcoming auction at St. John’s in Plymouth, Michigan, held in late July in conjunction with the Concours d’Elegance of America (formerly the Meadowbrook Concours), RM Auctions will offer a most unusual Pontiac – the transparent display car that GM built for the 1940s World’s Fair. As of yet, RM doesn’t have any detailed information about the Pontiac, but from an article in Special Interest Autos #34, we see that GM built two – possibly three – transparent cars for the New York World’s Fair of 1939-1940, one of which was a Deluxe seven-window touring sedan (B-body), the other of which was a Torpedo five-window touring sedan (C-body). It’s the former that was featured in the SIA article and which we see for sale here today, and if there’s any doubt that it’s the same one, compare the shots of the damaged rear fender in the SIA article and below. After Pontiac showed the Plexiglas-bodied car both in New York City and around the country, it ended up in the Smithsonian, where it remained through the duration of World War II. From there, it went to a couple of Pontiac dealers in Pennsylvania before another Pennsylvanian, Don Barlup, bought it in 1973. We know that it appeared at at least one of the concours events at Meadow Brook, back in 1996. Hopefully, RM will be able to fill us in on the remainder of the car’s history, though it appears from the photos that it’s been treated very well since then. Series 26. 85 bhp, 222.7 cu. in. L-head six-cylinder engine, three-speed manual transmission, coil spring independent front suspension, live rear axle with semi-elliptic leaf springs, and four-wheel hydraulic drum brakes. On the chassis of a 1939 Pontiac Deluxe Six, GM collaborated with Rohm & Haas, the chemical company that had recently developed Plexiglas. The world’s first transparent acrylic sheet product, Plexiglas was a serendipitous discovery arising from Rohm & Haas’ work with laminated safety glass. Using drawings for the Pontiac four-door Touring Sedan, Rohm & Haas constructed an exact replica body using Plexiglas in place of the outer sheet-metal. The structural metal underneath was given a copper wash, and all hardware, including the dashboard, was chrome plated. Rubber moldings were made in white, as were the car’s tires. It reportedly cost $25,000 to build – an astronomical figure in those days. Plexiglas went on to important military uses – bomber noses, canopies and gun turrets – in World War II, where its strength and transparency contributed mightily to the war effort. After the war, Rohm & Haas developed countless civilian applications, in signs, lighting fixtures, railroad cars and automobiles. With the capability of being molded into virtually any shape and new dyes that allow unlimited color selection, it remains an important commercial and military material. According to the GM Heritage Center, a second car, on a Torpedo Eight chassis, was hurriedly constructed for the 1940 Golden Gate Exposition on Treasure Island, a man-made island in San Francisco Bay. Once their respective showcases had closed, both “Plexiglas Pontiacs,” or “Ghost Cars” as they were sometimes known, toured the nation’s dealerships. The 1939-40 Deluxe Six is the only one known to survive. Following the dealership tour, it went on display at the Smithsonian Institution in Washington, D.C. and was reportedly there until 1947. It was later owned by a succession of Pennsylvania Pontiac dealers. It appeared at the first annual meet of the new Pontiac-Oakland Club International in 1973 and was purchased by Don Barlup of New Cumberland, Pennsylvania. Barlup commissioned a partial restoration from S&H Pontiac of Harrisburg and sold it to collector Leo Gephart in 1979. The current owner’s father purchased it from Gephart in the early 1980s, and it has remained in the same family ever since. The car is in a remarkable state of preservation, a testament to the longevity of Plexiglas in an era when automotive plastics tended to self-destruct within a few years. Although it has acquired a few chips and cracks, it is structurally sound and cosmetically clear, showing off the Ghost Car’s innards as it did in 1939. The car rides on its original U.S. Royal all-white tires and sports the correct white rubber running boards. From the beginning it was a running car, although extensive use would have been unduly detrimental. The odometer currently reads 86 miles. The only recent mechanical work has been replacement of the fuel lines. Not surprisingly, it has no conventional vehicle identification number; even the machined boss for the engine number is blank. The identification number traditionally used for the car is 3113436, probably a part number, found on the radiator. A collection of period photos and other memorabilia accompanies the car, which still turns heads as much as it ever did. It is not, obviously, suited for touring, but as a unique artifact from automotive and cultural history, it deserves a wider audience. It will certainly be welcome at all manner of shows and concours, as well as being suited for a singular museum display. It is no longer the only see-through automobile, but surely the first full-sized transparent car ever made in America has a unique spot in history. I would get that in a heartbeat if I were a millionaire! 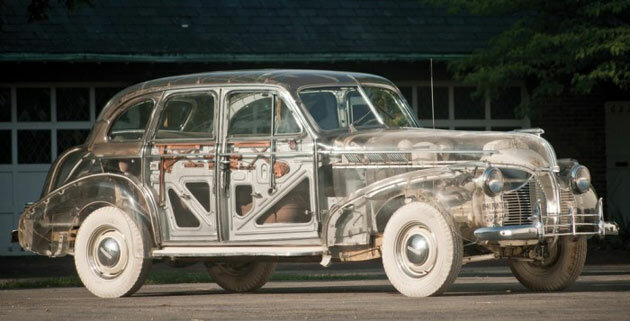 The see-through sedan was sold at RM Auctions' St. John's auction in Michigan on July 30, fetching $308,000. Not bad appreciation for a domestic oddity that cost $25,000 to build when new. You can check out the high-res gallery of its innards, including copper and chrome metalwork and white moldings and wheels, and get the exhaustive details on it after the jump. well, that was my car. Did you blow the $300k already? On Blows and Blow... nice! I love how Top Gear posted this to their Facebook today and all these small kids commented "That's stupid, you can't even drive it" and other things. I wanted to break their necks!! You're not supposed to drive this, IT IS A COLLECTORS ITEM! Kids these days don't have respect for history, I'm scared to see what happens in the future. If it was a honda they would all love it and want to do it to there own cars.